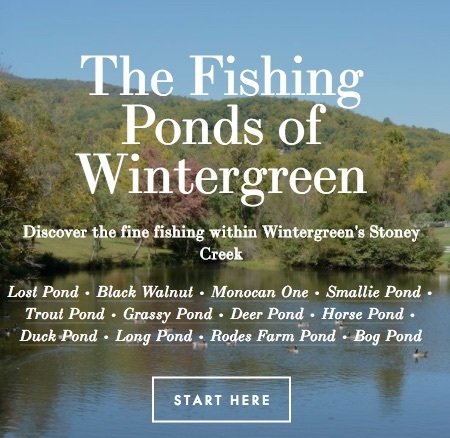 Visit the Wintergreen Sporting Club's online guide to The Fishing Ponds of Wintergreen. There are bluegill and largemouth bass in the lakes. Fishing is reported to range from excellent to poor, depending on the pond. In 2015 the Wintergreen Sporting Club started working with WPOA towards managing the ponds to improve fishing with the help of various wildlife agencies in the area. With the help of the Wintergreen Sporting Club, in 2016 the Wintergreen Property Owners Association added a trout pond with special rules. Details here. Learn more about fishing at and around Wintergreen here. Also providing excellent trout fishing is Stoney Creek itself where it flows within the boundaries of Wintergreen (not to be confused with Wintergreen's Stoney Creek subdivision). The trout stream on Old Stoney Creek Road offers opportunities for catching fish up to 20 inches. The stream is limited to fly fishing only with barbless hooks and is a catch and release area. The parking area is at the very end of Old Stoney Creek Rd. (VA-751) just off of Route 151; park to the side of the gate and note the posted rules. The property on both sides of the Stoney Creek stream is owned by the Wintergreen Community, and for Wintergreen property owners there is no charge for fishing. A Wintergreen resident decal needs to be visible on the vehicle. Day visitors and guests of property owners may obtain a one-day pass for $20 at either the Mountain Inn on the mountain or the WPOA Community Offices Building to the right of the mountain gatehouse. Passes are also available at the Nature Foundation at Wintergreen's Trillium House. Sherando Recreation Area is just 15 minutes from the Wintergreen mountain gatehouse. It offers miles of stocked trout waters and two large fishing lakes. Details here.